CHARLOTTE, N.C. (AP) — George Aston has felt the slights throughout his career. That’s why he’s not surprised so few give Pittsburgh any chance to topple No. 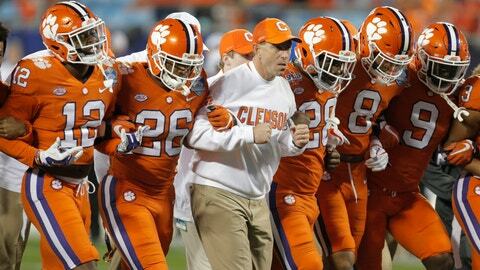 2 Clemson in the Atlantic Coast Conference championship game Saturday night. Aston and the Panthers (7-5) might be the only ones who believe there’s a chance to upset the surging ACC Atlantic winners. The Tigers (12-0, CFP No. 2), three-time defending ACC champions, enter with the conference’s top scoring offense and a defense that’s No. 1 in the league in keeping opponents from scoring. Clemson tailback Travis Etienne, the ACC’s leader with 1,307 yards and 19 touchdowns, was named league player of the year. The Tigers experienced and heralded defensive front of ends Clelin Ferrell and Austin Bryant and tackles Christian Wilkins and Dexter Lawrence have locked down the line of scrimmage by allowing less than 85 yards a game rushing. Tigers receiver Hunter Renfrow said becoming the first to win four consecutive ACC crowns is a goal they’ve sought all year. Clemson has not lost many games in that time, although it knows what it’s like to lose to Pittsburgh. Among the two regular-season losses the Tigers have had (they’ve gone 46-2 the past four regular seasons), one was a 43-42 stunner unranked Pitt pulled on No. 2 Clemson in November 2016. Pitt coach Pat Narduzzi said that result won’t have much bearing on this game, although Aston said there’s much the Panthers can take from the win. “We really do have good luck playing No. 2 teams,” he said.